Camelback Lodge seen from the top of Camelback Mountain, Poconos. Rock climbing wall at the Camelback Lodge for apres ski fun. 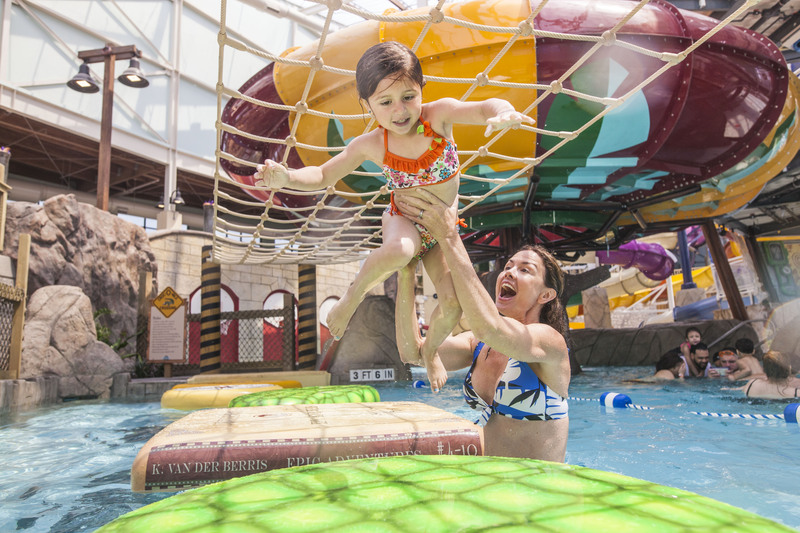 All ages can enjoy waterplay at the Aquatopia waterpark, Camelback resort. In a winter where snow is scarce across the United States, planning an extended ski vacation can feel like an expensive risk, especially for those new to the sport. 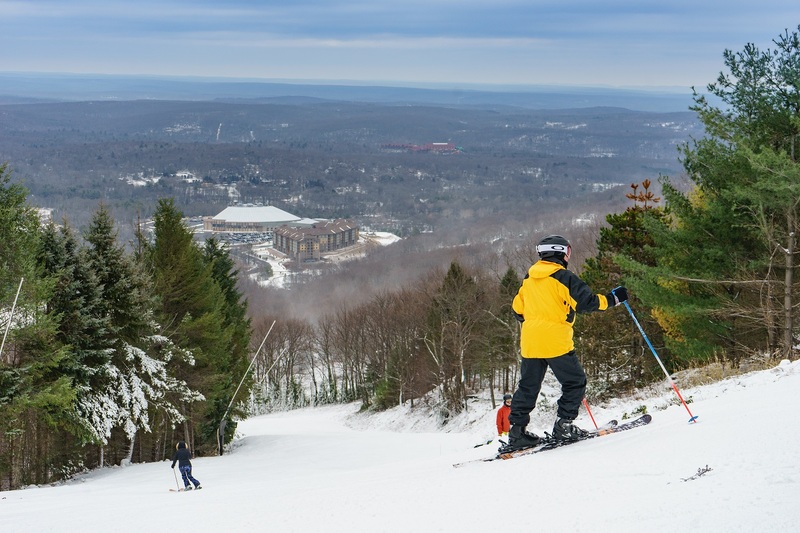 Tristate families can minimize the risk and maximize the fun by planning a trip to Camelback Mountain, Pennsylvania, which is an easy drive from New York City and offers everything from equipment rentals and lessons to a wide variety of dining options and night skiing. Skis, snowboards and accessories can be expensive and cumbersome, especially if you’ve got kids in tow and don’t get to the slopes often. But Camelback has you covered. Renting equipment is easy and rentals are kept in good condition so you can feel confident that you’ll be safe in gear that fits and is adjusted to your experience level. In addition to skis, boards and boots there are goggles and helmets available to keep your kids warm and safe. For those new to skiing or snowboarding, Camelback is the perfect place to learn whether it’s in a group or private lesson offered by incredibly friendly (and patient!) instructors. With over 250 professionally trained instructors, group lessons are small enough that each new skier gets the attention they need as they watch demonstrations and are given personalized advice and adjustments as they try it for themselves. Once you learn the basics and are ready to explore more of the mountain, you won’t be disappointed. Sixteen lifts give you access to 34 trails that vary widely in their steepness, offering an adrenaline rush for experienced skiers but also plenty of terrain for those still learning (39% of the trails are beginner or intermediate). With over 1,200 snowguns across the mountain, even during an unusually dry winter like this one, the majority of the trails are open and groomed to make for high quality skiing. And sunset doesn’t mark the end of the ski day! All the trails are fully lit, making it easy to continue skiing throughout the evening. You can even purchase a Twilight ticket if you make it up to the mountain after 3:00, not only saving you some money but also guaranteeing shorter lift lines. Those with tired legs after a morning of skiing can head to the Snowtubing Center to sit back and let gravity do the work. With 42 lanes, Camelback boasts the largest snowtubing center in the United States and it truly is fun for all ages. Adults and children alike are whisked down the lanes in single or double tubes that offer plenty of padding and protection. And then it’s back up to the top. Thanks to a “magic carpet” apparatus, the ascent is painless as you simply pull your tube onto the belt with you and hold on as it carries you up the slope. This truly is magical, offering all the fun of extreme sledding without the misery of carting kids and tubes uphill. Whether you’re coming in from tubing or skiing, Trail’s End Pub is the perfect place for a bite to eat after a full day on the snow. Ski right up to the pub’s outdoor balcony to sit by one of the fire pits or head inside to warm up with a burger and fries. Regardless of where you chose to rest, you can look out of the giant windows which offer a great view of some of the most popular trails on the mountain and there is a lift just feet away from the balcony, making it easy for tireless skiers to get back out on the slopes. Less than two hours by car from New York City, a visit to Camelback is an easy day trip, but if you are looking for a wintery weekend or extended vacation, the convenience and amenities of Camelback Lodge are unparalleled. The lodge opened its doors in the summer of 2015 and still feels new, clean and inviting. A lot of thought went into planning a lodge catered to skiers and families and the evidence is in the details. For those with skis, you can access the mountain straight from the lodge or free shuttle service to the base of the mountain is clearly marked and runs frequently for those who need to rent skis. At the lodge itself, there are endless amenities to entertain everyone in the family. Most notably, Aquatopia is a cavernous indoor waterpark that houses over 37 rides, slides and pools. Similar to the ski mountain, the water attractions range from a series of pools designed specifically for young children to slides and a surfing activity that are challenging or extreme enough so older kids won’t bore quickly. And, perhaps most attractive after a long day of skiing, the giant hot tub does wonders for aching muscles. Cabanas are available for rental, outfitted with TVs and food service, and they provide an excellent place for families to gather, store towels or dry off. 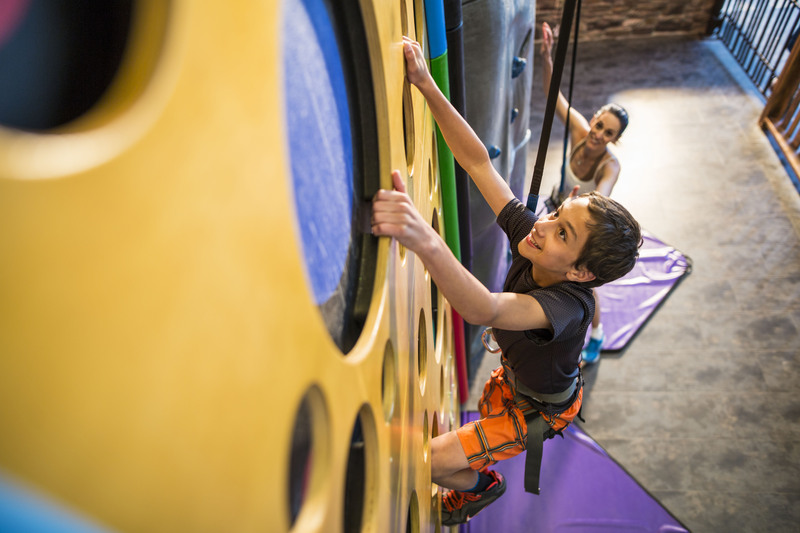 If the 37 slides and pools aren’t enough to keep your little ones entertained, there are plenty of other indoor activities including mini golf, an arcade and game room featuring laser tag and a sizable rock climbing wall and ropes course. Everything about this expansive lodge is dual-purpose: entertain (and tire out) kids while providing adventure and relaxation for adults. Camelback truly delivers a winter and waterpark wonderland. Driving? Set your GPS to Camelback Mountain, 301 Resort Drive, Tannersville, PA 18372. For current rates and information about skiing and staying overnight, please visit Ski Camelback or call them at 570/629-1661.